Wahab Riaz is bringing back a cutting edge to the Pakistan team, an edge that appeared dulled over the last five years following the spot-fixing controversy that cost the country its two best bowlers - Mohammad Asif and Mohammad Amir - and appeared to subdue the innate confidence of the other quicks. Since 2010, there has been extra vigilance around Pakistan and their players have often been instructed in what to do and what not to do. Under Misbah-ul-Haq's leadership, the team shed much of its stormy characteristics and built itself around more stable performers. But something was lost. 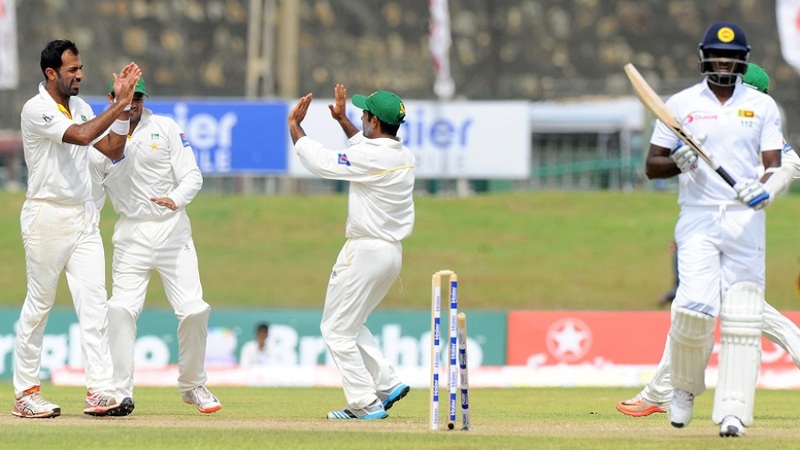 The Pakistan batting stumbled in Galle, and they ended the third day on 118 for 5, trailing Sri Lanka by 182. Their coach Waqar Younis rued the performance, which gave Sri Lanka a significant edge with two days to go. "I am disappointed without a doubt as we could have done better with the bat," Waqar said. "Unfortunately, poor shot selection let us down and put us in a situation where two days seems like plenty of time. But we really have to come back hard tomorrow and repair it again. We have to make sure this ongoing partnership keeps on going. Wahab bowled with some serious fire and Yasir spun the ball, but the batting really let us down." From Khan Mohammad and Fazal Mahmood to Sarfaraz Nawaz and Imran Khan to Wasim Akram and Waqar Younis to Shoaib Akhtar to Mohammad Asif and Mohammad Amir, Pakistan's quicks have always had something more to offer than the routine fast bowler. Over the last five years, though, no bowler has been able to make Pakistan forget the loss of Asif and Amir, because of the excitement they provided. And then Wahab bowled that spell in the World Cup quarterfinal in Adelaide to make everyone watching sit up and take notice. Wahab always had it in him, and the Australians only roused it, waking up the Lahori inside with their baiting. Shane Watson bore the brunt of Wahab's anger during one of the most memorable spells of short-pitched bowling in recent memory. Wahab's resurgence as a fast bowler, however, did not begin at the 2015 World Cup but during the Colombo Test in August last year, when he took 6 for 164 in the match. He became Pakistan's driving force, and though his stats may not be the best, on any given day Wahab's aggression can be awesome when he channels it through his bouncers. "You must always have an attacking option, an x-factor in the team," Waqar said about Wahab after the end of the second day's play in Galle. "When you play four bowlers we look for a bowler who attacks in smaller spells and picks up some quick wickets. And since Adelaide, Wahab has a lot of firepower and has done really well so far. It's good to have him in the squad and he is a match-winner when he gets it right." For Wahab, cricket is a passion and not essential for a livelihood. He hails from a wealthy Lahore family and is playing to satisfy his love for the game. His career has zigzagged since his international debut in 2008 and most of his best performances are under the coaching of Waqar. Playing his 11th Test, Wahab has only one five-for, and only from the start of 2014 has he been a consistent selection for Pakistan. On the second day of the Test at the picturesque ground in Galle, the main attraction other than the old fort by the sea was the battle between Wahab and Kumar Sangakkara. Wahab mostly bowled short and fast, touching speeds of 93 mph, and threw in some stares to go with his bouncers. One struck the batsman on the shoulder. Wahab bowled 24 balls at Sangakkara and conceded 12 runs before forcing an edge to slip to win the duel. Wahab finished with figures of 3 for 74, having accounted for three of Sri Lanka's top five batsmen.